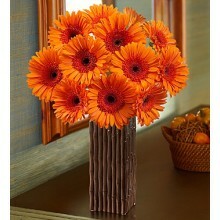 The Colorful World Gerbera Daisy Bouquet was created to spread warmth, cheer and light with its amazing blooms! 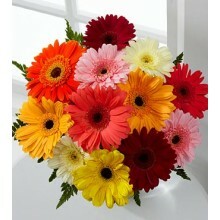 Gorgeous 15 gerbera daisies arrive in an assortment of vibrant hues to create an unforgettable flower arrangement. 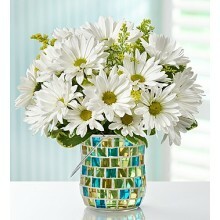 Presented with a clear glass, or green glass vase Your purchase includes a complimentary personalized gift message. 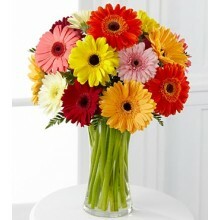 The Colorful World 10 Gerbera Daisy bouquet was created to spread warmth, cheer and light with its amazing blooms! 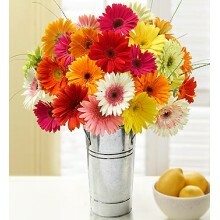 Gorgeous gerbera daisies arrive in an assortment of vibrant hues to create an unforgettable flower arrangement, this flower bouquet offers uplifting grace and a spirited ray of sunshine to make this day one your special recipient will never forget, making it a great birthday, get well, or thank you gift. Your purchase includes a complimentary personalized gift message. The simple, bright beauty of a white daisy pom always delivers a smile, whether it's a single bloom or a perfect posy picked fresh from the garden. Send a great big bunch of smiles with this fresh bouquet of daisies and sunny yellow solidago, hand-arranged by our florists. 10 white gerberas in a clear glass vase. Glass vase design may vary. Your purchase includes a complimentary personalized gift message. Bring back childhood memories of days spent picking fresh flowers with our charming arrangement. 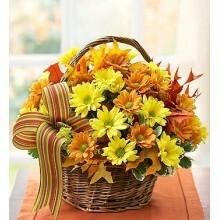 Cheerful yellow and bronze daisies, hand-designed in a rustic handled basket, will make them smile like they're a kid again. A bright way to celebrate birthdays, anniversaries, housewarmings or “just because”. Your purchase includes a complimentary personalized gift message. Imagine sitting on the porch of a rustic country home watching a golden sun fall just behind the horizon. That's what inspired out expert florists to design this truly original arrangement. 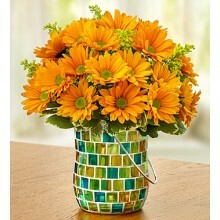 Daisies as vibrant as the setting sun are accented with fresh greens. 20 golden gerberas in a vase. Design Vase May Vary. Your purchase includes a complimentary personalized gift message. 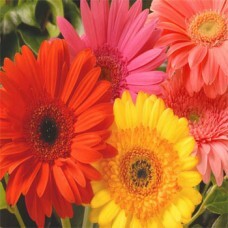 Give a gift of instant smiles-- fresh, gorgeous 20 stems Gerbera daisies in vibrant assorted colors. A traditional favorite of French royalty, Gerberas are symbolic of cheerfulness, innocence and purity, and are simply perfect for any occasion or any age of flower-lover. Vase is not included. Your purchase includes a complimentary personalized gift message. 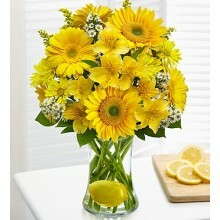 In honor of the graceful, lemonade-making optimists of the world, may we present this joyful, bright bouquet of yellow Gerbera daisies and/or sunflowers, alstroemeria, daisy poms and more, designed in a striking glass gathering vase -- with an added twist of a real lemon. Your purchase includes a complimentary personalized gift message. Straight out of the pumpkin patch, our radiant bouquet of one dozen orange Gerbera daisies is just the thing for sending smiles. Gathered fresh at select floral farms, these cheerfully bright blooms make a sunny surprise for best friends, faraway family members or the one who always brightens your day. Vase Is not Included. Your purchase includes a complimentary personalized gift message. 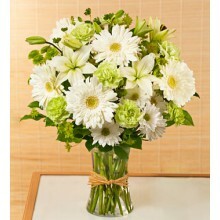 This peaceful green and white arrangement of carnations, Gerbera daisies, lilies, daisy poms and more, stylishly arranged in a clear glass gathering vase, will have them reflecting and meditating on your thoughtfulness. Your purchase includes a complimentary personalized gift message. Beautiful Spring inspired hand-tied bouquet of lavender, mauve, pink and yellow blooms. 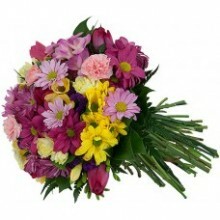 Flowers varieties may include tulips, daisy poms, carnations, freesia and more. Your purchase includes a complimentary personalized gift message.